Supplied: In three litre containers of peat free compost, healthy and well established, approximately 150cm (5 feet) high, with full planting and aftercare instructions. An awkward name for one of nature's most striking trees. This medium size tree has a columnar habit and is a superb choice for both property lines and woodland verges as well specimen plantings for parks and gardens. 'Dawyck' originates from the Dawyck Estate in Scotland and was brought into cultivation before 1850, this golden form was developed by he Dutch in 1969. Dawyck Gold grows slowly, eventually reaching an ultimate height of 50 feet or more with a spread of only 10-15 feet. Used correctly is can provide the most stunning architectural contrast in the landscape. 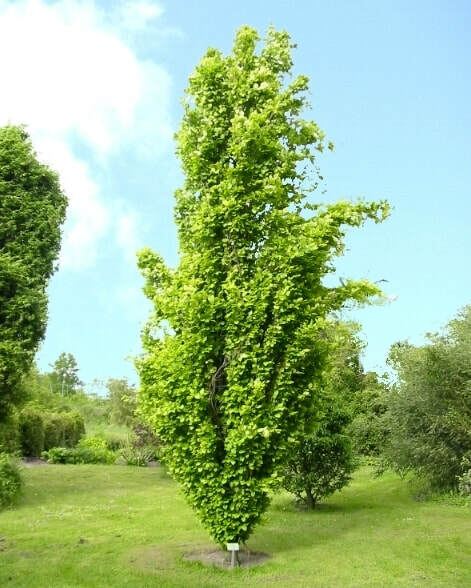 In addition to its excellent form, it has the typical beech characteristics of smooth handsome bark and bright green foliage that is almost yellow at first in spring before greening up mid summer and then returning to shades of golden yellow and orange come autumn. Dawyck beech thrives just about anywhere other than exposed coastal locations. It does well in most reasonably fertile, well drained soils, except heavy clay or very light sandy soils. Fully hardy.